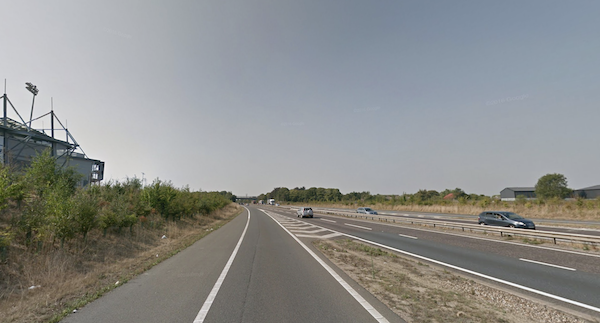 A motorcyclist was heading towards the southbound carriageway of the A12 from the B1389 (junction 22) close to Coleman's Bridge near Witham, Essex. In front of him was a motorist who also intended to join the A12 from the slip road. As they approached the main carriageway, the motorcyclist turned his head to look for oncoming traffic on the A12. He saw a lorry following another vehicle and judged it was safe to proceed if he accelerated. He began accelerating and then turned forward only to find the car driver in front of him had stopped. The motorcyclist braked hard but a collision occurred. He was propelled into the side of the oncoming lorry and suffered severe injuries. The motorcyclist raised an action in Court. He argued that the defendant (the car driver) had been negligent for stopping at the bottom of the slip road resulting in their collision and his injury. In response, the car driver averred it would not have been safe to have entered the main carriageway because of the oncoming traffic and the accident had been wholly caused by the claimant. In assessing the case, the Judge had a number of factors to take into account to determine if the defendant had been negligent. However, the Judge decided to give significant weight to the witness statement of the lorry driver. The lorry driver assessed the situation as potentially hazardous for the defendant to have continued onto the main carriageway. Therefore, it was reasonable and right for the defendant to have slowed down and halted before proceeding. Any acceleration would have been unsafe, given the circumstances. It was acknowledged that the claimant (motorcyclist) could have possibly accelerated ahead of the lorry successfully. Nevertheless, the case centred on the defendant’s actions and his capabilities as a motorist which differ from those of a motorcyclist i.e. unable to accelerate as quickly and it was decided the defendant had not been negligent. Contributory negligence was not decided upon because the motorist was not held liable. However, the Judge commented that the motorcyclist had contributed to their injury by not maintaining a safe distance away from the motorist in front and by not keeping his eyes on the road. Additionally, the motorcyclist had accelerated without looking ahead. The motorcyclist had assumed too much in the situation and had failed to properly observe and react to the surroundings. If negligence had been found against the driver, the Judge would have reduced the motorcyclist's compensation by 75%. The full case can be viewed here.